Is there an "approved" place to connect an external, normally closed, reset switch? Do you want to hard reset the board? If so the reset pin is on the expansion header on pin 44. For this option I need to bridge pin 44 with gnd? Or another pin? I was thinking of duplicating the function of the reset button on the board but I have a Duex5 so I cannot use the expansion connector. Is there any other place to connect to? My recommendation would be to use the external trigger to trigger M112/M999 as explained in the link because there is not another location that the reset wire is exposed. Thanks much - will give that a try. Can someone specify a bit more in detail what is going to happen AFTER executing an M112 midprint or mid-homing or something else? What if M112 is executed while homing? Or a long G1-move? M112 may be delayed a little depending on how busy the processor is. Whereas the reset button stops everything immediately and restarts the Duet. Does "a little" mean: "after the currently executed commands are done"? Or does the DUET interrupt mid-command? M112 will interrupt mid command. But until I migrate the firmware to RTOS, it may have to wait for an SD card or network transfer to complete before the processor sees the M112 command. Is this intended to be a "Reset" or an "E-Stop" in the TRUE sense of e-stop? True e-stops, as found in the machine shop floor CNC world are quite rare on 3D printers. Even if the switch looks like below, it is often wired up as a "Stop" not an "E-Stop". What is the difference? "E-Stop" forces it, no matter what the machine state, including totally hung software, firmware, and most of the hardware. As an example, many "E-Stop" on CNC are wired into a board with gates that inhibit the stepper driver enable lines. Pure hardware, and 'very far downstream' close to the motion. My CNC E-Stops that are on boards like the Tiny-G that did not truly accommodate E-Stop in the hardware… those E-Stop switches are wired to cut the power provided to the controller board (and motor drivers logic side, where external drivers are used). Hitting the latching E-Stop physical switch stops the machine INSTANTLY, within the realm of friction and inertia. The motors certainly do not take even one more step. In the individual case of the Duet, the full power for all drivers, bed, etc, (the main big green VIN with screw connectors) should NOT pass through the e-stop loop. Instead, set the jumper "Ext 5V EN", and then use the e-stop loop to break the 5v flowing into the separate (pin) connector (labeled "EXT 5V" in duet wiring diagrams). Why not fit an emergency stop yellow switch with big button in the mains supply to the machine? 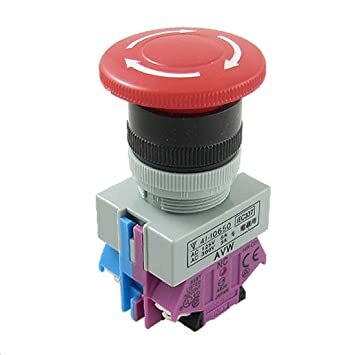 Or use an rcd plug placed next to the machine which has a test button, this is even better as it breaks live and neutral and offers protection from ground leaks, shorts and current imbalance all at once. If you have power fail/resume correctly setup you can potentially restart your print once the problem is resolved. Because cutting the mains will allow the machine to operate for several seconds. This SHOULD be a shutdown, as the board senses power loss, etc. And your point about resume is valid if everything is set up correctly. But… that is a "Stop", not an "E-Stop". Which may be fine for 3D printers. And it is certainly your decision. At the same time, make an informed decision: If you want true E-Stop, freeze the machine instantly, not one more step, then cutting the mains misses that mark.